Summer is upon us and we are extremely busy! We continue to be blessed with an abundance of work, and strive to be ‘committed to excellence’ with each project we undertake. To all those laboring out in the heat, don’t forget to work safely and stay hydrated! Speaking of safety, we have scheduled our annual Safety Training Day and Employee BBQ for Friday, September 1. We are excited to have all Emory employees in attendance for a day of safety training sessions and a wonderful time of fellowship and fun (and great food of course)! We are looking forward to teaching a few new classes this year such as a Lanyard and Safety Harness Training as well as some other classes created and chosen by employees and their safety needs. 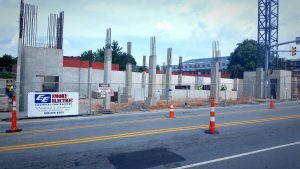 Our featured project this month is one of our newest projects – 45 Asheland in Downtown Asheville. We are proud to say that we are breaking ground and are excited about moving forward with production! If you’d like to learn more about the progress on this project, you can visit their website at http://www.45asheland.com/.